North American Mustang Mk.IA FD552 ‘N’ flown by Flying Officer Frank Normoyle RAAF, photographed near Gatwick in late May 1944 during flying training exercises in preparation for D-Day. Photographed by Flying Officer Basil Rachinger RAAF flying Mustang Mk.IA FD544 ‘V’. Note the cooling air outlet from the under fuselage radiator assembly in the ‘down’ position. No.268 Squadron Royal Air Force was reformed at Westley in the UK on September 30, 1940 as an Army Co-operation Command Squadron flying Westland Lysanders. 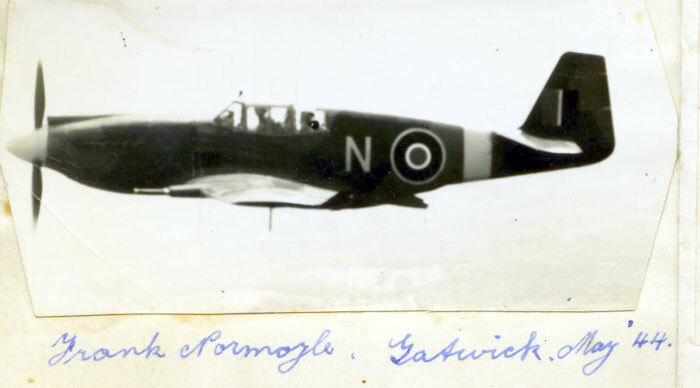 In April 1941 the Squadron moved to Snailwell and soon after re-equipped with the Curtiss Tomahawk. April 18, 1942 saw the Squadron receive the first of its North American Mustang Mk.I aircraft, and the Squadron soon commenced operations on the Mustang. In 1942 the emphasis was primarily on shipping reconnaissance of the coast of Holland and in the northern section of the English Channel, ‘Jim Crow’ and ‘Lagoon’ sorties, interspersed with number of offensive operations over the Netherlands and western Germany, ‘Rhubarb’ sorties where they would shoot up any targets of opportunity seen enroute. On October 21, 1942, the Squadron flew the first ‘Rhubarb’ by single engined RAF fighter based in the UK against targets in western Germany. The Squadron during this time was also gaining experience with the use of the F.24 oblique reconnaissance camera fitted behind the pilot’s head in the Mustang. In early 1943 the Squadron continued with its operations along the coast of the Netherlands, the occasional ‘Rhubarb’ a few diversion sorties in support of RAF bomber operations. In May 1943 a major change took place with the Squadron commencing operations that would see them concentrate their efforts on France, in particular the French Coast and all manner of German military installations, bridges, major roads, railways from southern Belgium to the southern coast of the Cherbourg peninsular. 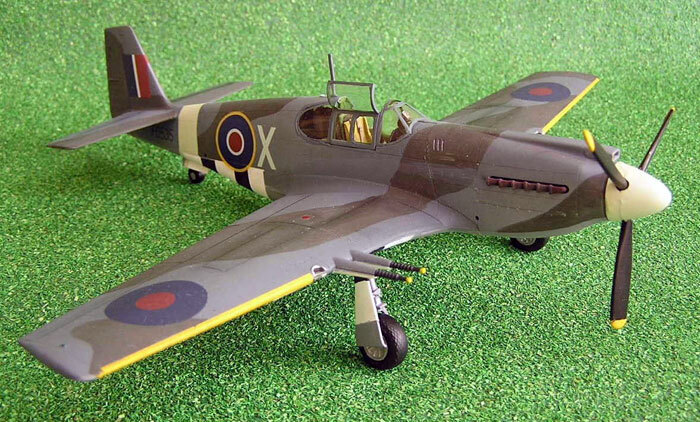 June 1943 saw the Squadron commence re-equipping with the North American Mustang Mk.IA, the latest variant of the Mustang then entering RAF service and armed with four 20mm cannon. In this time frame the Squadron was also conducting tests with the fitment of a vertical camera in the tail of the Mustang to permit overhead photography of targets, to supplement the oblique photography already being obtained. 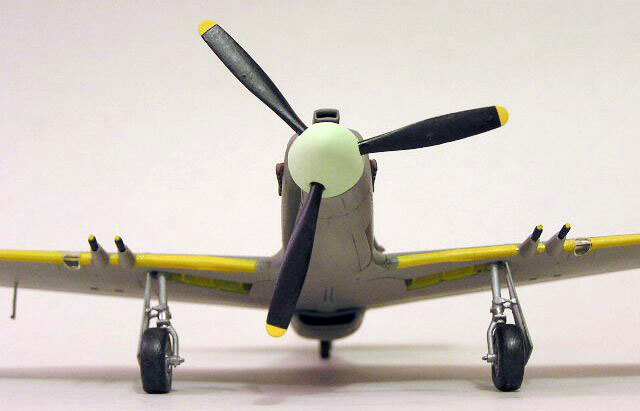 The vertical camera installation pioneered by the Squadron was adopted as the standard for the RAF Allison Mustangs. Early 1944 saw the Squadron attend an Armament camp at Llanbedr in Wales and a Naval Gunnery Control Course at Dundonald in Scotland, as well as continuing a concentrated program of specialist photography of beaches, German defence installations and the French road and rail network. The emphasis on targets in the area between Dunkirk and Cherbourg was maintained throughout that time, although the area along the Normandy coastline between Trouville-sur-Mer and Bayeux were subject to special scrutiny. The Squadron had been relocated to Gatwick to join the other components units in 35(Recce) Wing, NoII(AC) Squadron and No.4 Squadron. 35(Recce) Wing was tasked to operate in support of 1st Canadian Army for the planned Invasion and afterwards. In May 1944 the Squadron flew a number of special ‘urgent’ sorties, tasked to check the state of German anti-invasion preparations along specified beaches in the Normandy region, and to also check the state of anti-glider and anti-paratroop obstacles in areas immediately behind the Normandy beaches. By the beginning of June 1944, the anticipation for the forthcoming invasion of Europe was high, and preparations were complete. Members of No.268 Squadron Royal Air Force, photographed at Gatwick in late May 1944, just before D-Day. Note the annotations made on the photograph at the time indicating the fates of some of the pilots in the photograph: X = killed, M = missing, P = posted. Unfortunately, a number of those marked M, were eventually determined to have been killed in action, and even some of those posted did not survive the War. As the fateful date of 6 June 1944 grew closer, those in the Squadron could not miss all the signs that the date for the long awaited invasion of Europe was close at hand. The heavy concentrations of military equipment and personnel in southern England grew more intense every day. In the week leading up to D-Day, the continual movement of convoys of military vehicles towards the invasion embarkation ports could not be missed. In addition, the concentration of paratroop aircraft, assault gliders and their tow aircraft on many airfields was a sure sign of what was to come. The weather finally cooperated sufficiently that the long planned program of air to air firing practice could take place. Three sections of three Mustangs were dispatched. They made rendezvous with the target towing aircraft and then escorted it into the firing range area. In turn each pilot made their practice firing passes on the towed drogue and then returned individually to Gatwick. By the time the final section rendezvoused with the target towing aircraft the weather conditions had deteriorated and further firing was impossible. At the request of the Army, the Squadron conducted an Arty/R procedure practice using six of the Squadron’s Mustangs and pilots. Flt Lt RJF Mitchell DFC of HQ 35 (Recce) Wing conducted an air test on one of the Mustangs. Sqdn Ldr Mann DFC conducted a camera test on the Hawker Typhoon. Three new pilots were posted to the Squadron, Flt Lt FG ‘Pluto’ Barber. Flg Off GWG ‘Bucky’ Buckland and Flg Off WG ‘Wally’ Creevy. Flt Lt Barber already had an association with the Squadron dating back to 1940 and 1941, when as an Army Officer he had been taken for a number of Air Experience flights in the Squadron’s Westland Lysanders when they were based at Westley. Six pairs of Mustangs stood by for operations from very early in the morning until early evening, when four of the pairs were released. The final two pairs of Mustangs were not released until very late in the evening. As such there was no operational activity for the day. Flg Off Garside made an air test on one of the Mustangs, and Flt Lt Lissner combined an air test with some oblique photography practice. Sqdn Ldr Mann made a cross country flight to Llanbedr where he landed with hydraulic failure. New was received during the day that Squadron Leader AS Mann and Flg Off DM Ashford had both been given the immediate award of the Distinguished Flying Cross for their actions on their mission over Boulogne of May 24, 1944. The official notification would not appear in the London Gazette until June 23, 1944. The air to air firing program was recommenced during the day. Again three sections of three Mustangs conducted firing practice against a towed drogue, and again the last section met deteriorating weather conditions requiring the cancellation of the last session. Flt Lt Barber, Flg Off Buckland and Flg Off Creevy all made local familiarisation flights, combined with pinpoint photography practice. Flg Off Garside conducted a flight test of one of the Squadron’s Mustangs, and Sqdn Ldr Mann DFC was able to return from Llanbedr after temporary repairs had been completed on Mustang W.
Gp Capt Donkin and the 35 (Recce) Wing Intelligence Officer, Sqdn Ldr Laurence Irving, attended a conference at 2TAF Headquarters at Uxbridge, where Air Marshal Sir Arthur Coningham opened the conference to the packed room with the words, “Gentlemen, we are now at D minus two!”. D-Day was thus originally set for Monday June 5, 1944. This naturally enough produced a massed intake of breath which was rapidly followed by mixed feelings of anticipation of what was to come, and relief that “the day” was soon to be upon them. Following the conference presentations which outlined the overall strategies and arrangements for D-Day, the signing for and receipt of information packages, Gp Capt Donkin and Sqdn Ldr Irving returned to the Wing’s base at Gatwick, where key personnel, including the Commanding Officers of the three Squadrons, 2, 4 and 268, were appraised of the situation. Arrangements had to be quietly put in place to ensure all aircrew and aircraft were ready for a maximum effort on D-Day. Three pairs of Mustangs were on standby for operations from 07.00 hrs, with another three pairs being required on standby after 08.15 hrs. Eventually only one operational Photographic Reconnaissance sortie was flown for the day. Flt Lt Woodward in FD506 A and Flg Off Bradford in FD546 G were finally briefed at 16.00 hrs for a photo reconnaissance of RDF installations south west of Etrat/Cap D’Antifer. The briefing was unusually long and comprehensive as they were to use the new compensating camera variant of the F.24, which required exact speeds, distances and heights to be attained and maintained during the photo run in order to achieve the best results. They took off at 18.30 hrs and arrived over the target area without incident. A large amount of flak was experienced by the two aircraft around the target area, but neither was hit and they both safely returned to base with the required photography. 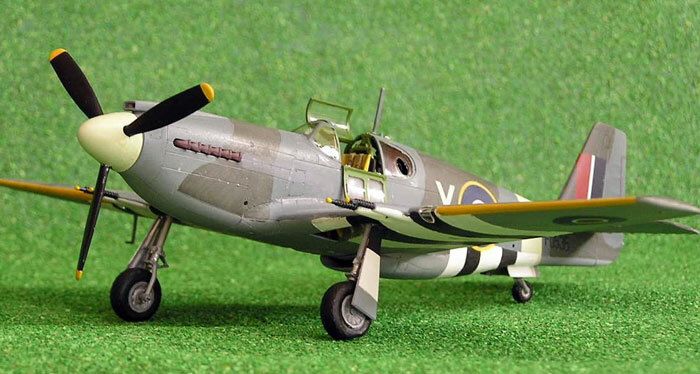 Flt Lt Woodward’s Mustang developed some engine troubles on the return flight but they were not serious. Photograph taken not long before D-Day of one of No.268 Squadron’s Mustang Mk.IA aircraft during a reconnaissance sortie along the French coast, photographing beaches, invasion obstacles and other targets of interest. This was a comparatively quiet day. Flying training was conducted during the day, eleven sorties including air tests, pairs flying and photographic practice being conducted without incident. Poor weather conditions over southern England and western France, which included high winds, low cloud and rain, had forced the postponement of the invasion for 24 hours, with a predicted change in the weather to more suitable conditions for June 6, 1944. On the evening of June 5 1944, the Squadron’s pilots were informed by Gp Capt Donkin that the invasion would begin at midnight with the first waves of airborne forces soon to be on their way, and that the seaborne invasion forces would land at first light the following morning. All personnel were confined to camp, and spent a listless night listening to the drone of paratroop aircraft, glider tugs and heavy bombers passing overhead on their way to France. For those on the Squadron, the final sign was the Squadron’s Mustang aircraft being marked with the black and white invasion stripes to assist in the recognition of Allied aircraft over the invasion area. 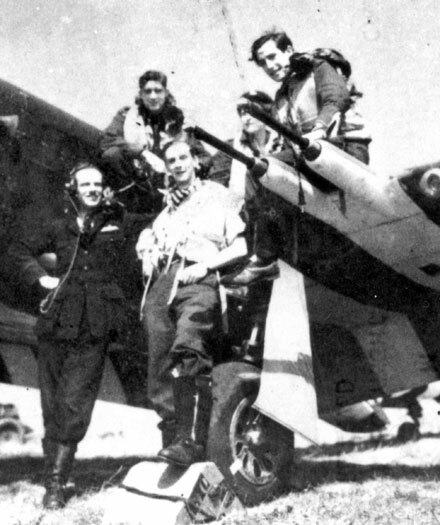 Distinct to other Allied air units, the low level tactical reconnaissance squadrons had received a dispensation regarding the extent to which they would carry the black and white invasion stripes. Whilst most other aircraft were required to carry the black and white invasion stripes fully encircling the fuselage and wings of the aircraft, in order not to compromise the effectiveness of the camouflage worn by the Mustangs when operating at low level. So they were only required to paint the invasion stripes on the under surfaces of the rear fuselage and under both wings where they would be most visible to Allied naval forces and ground troops. The Wing HQ had put in place arrangements for the timely and neat marking of the Wing’s aircraft with the required identification stripes with all Wing aircraft being painted and ready well in time for the following day’s operations. For D-Day the Squadron flew its first operations for the day from Gatwick and then moved to RNAS Lee-on-Solent as a part of the “Fleet Spotting Pool”. They were tasked in the morning with naval gunfire spotting for British Home Fleet Units operating in support of the landing forces and reconnaissance photography of the invasion beaches. All aircrew were up and active at 03.30 hrs for briefings and preparations. The detailed briefings for the naval gunfire spotting sorties were given by Captain Parish RN and Captain Wilson RN. The first three pairs took off for naval gunfire spotting at 05.00 hrs, with a further five pairs following at 05.50 hrs. Three remaining aircraft were flown to Lee-on-Solent from where operations would continue. Photograph taken by one of the sorties flown by No.268 Squadron on D-Day of the Allied landings at Anselles. Note that the photograph is actually a composite of two overlapping photographs, the overlap point being down the centre of the photograph. Note also the vehicles moving away from the beach area on the road towards the top of the photograph. Flg Off Clarke in FD562 C and Flg Off Cullen in FD546 G took off at 04.55 hrs for a naval shoot. Their first shoot was successful but the second failed due to weakening radio contact with the naval vessel. They encountered intense and accurate heavy flak whilst over the invasion area. Flt Lt Lissner in FD506 A and Flg Off Rachinger in FD476 B took off at 05.00 hrs for a naval shoot. They arrived over the area to find their targets had already been neutralised and therefore conducted an impromptu shoot with their assigned naval units. Flg Off Gibson RCAF in FD507 H and Flg Off Bradford in FD498 J took off at 05.00 hrs for a naval shoot. Both their shoots were very effective. They encountered intense and accurate heavy and light flak whilst over the invasion area. Flt Lt Reahil in FD486 H and Flt Lt Lewis in FD552 N took off at 05.45 hrs for a naval shoot. Their first shoot was very successful with the target being destroyed, but their second had to be aborted as the target was obscured by heavy smoke. Flg Off Conway RCAF in FD561 O and Flg Off Lavender in FD549 took off at 05.50 hrs for a naval shoot. Their first target was destroyed but the second target was not engaged by the ship. Flt Lt Woodward in FD495 R and Flt Lt Boughey in FD541 T took off at 06.00 hrs for a naval shoot. No shoots took place as the targets were obscured by heavy smoke. They encountered intense and accurate light flak, some of it believed to be coming from Allied naval vessel below them despite the identifying invasion stripes on the aircraft’s undersides. 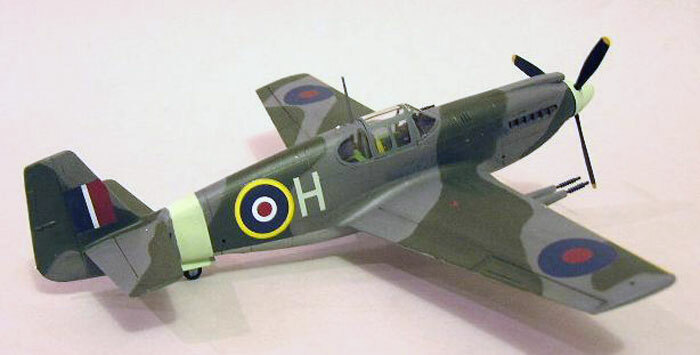 The Squadron’s one recorded loss for D-Day, was Mustang Mk.IA FD495 R flown by Flt Lt ED Woodward, which is recorded as missing, having failed to return from a naval gunfire observation tasking over the invasion area. He called in by radio to the airfield at Gatwick to report engine trouble over Ouistreham, but failed to return. It is possible that Flt Lt Woodward’s Mustang may have been hit by some of the flak reported as being encountered on that sortie by Flt Lt Boughey. Flt Lt ED Woodward has no known grave and is recorded on the Runnymede Memorial in Sussex. Flg Off Yearwood in FD544 V and Flg Off Lloyd in FD557 Z took of at 06.00 hrs for a naval shoot. No targets were engaged as the ship had already engaged and destroyed the targets before the aircraft arrived. Gp Capt Donkin DSO in FD471 E and Flt Lt Tuele RCAF in FD472 M took off at 05.30 hrs to conduct a visual observation of the invasion beachhead area. Intense and accurate light and heavy flak was encountered during the time the aircraft were in the beachhead area. Flt Lt Lissner in FD506 A and Flg Off Rachinger RAAF in FD476 B took off from Lee-on-Solent at 08.25 hrs for a second naval shoot. The planned targets had already been neutralised by the naval bombardment by the time the aircraft arrived on station, and they were requested to perform an ad-hoc Tac/R of Port En Bassin by the French ships they were in contact with. Flg Off Gibson RCAF in FD486 H and Flg Off Bradford in FD498 J took off at 08.30 hrs from Lee-on-Solent for a second naval shoot. They directed the naval bombardment onto an enemy shore battery that was engaged and partially destroyed. Flg Off Clarke in FD562 C and Flg Off Cullen in FD480 G took off at 08.40 hrs from Lee-on-Solent for a second naval shoot. Neither of the original targets they had been briefed for was engaged, however they conducted an impromptu shoot with the Naval vessels on two other targets which were successful. Flg Off Conway RCAF in FD561 O and Flg Off Lavender in FD535 X took off at 09.30 hrs from Lee-on-Solent for a second naval shoot. Neither briefed target was engaged due to R/T failure. Intense inaccurate light flak was reported coming from the target area and units of the Royal Navy. Flg Off Boughey in FD541 T and Flg Off Garside in FD(SIR) D took off at 09.30 hrs from Lee-on-Solent for a second naval shoot. Neither briefed target was engaged as they had already been neutralised by naval bombardment and they were directed to return to base. Slight heavy flak was reported in the area. Sqdn Ldr Mann DFC in FD447 and Flt Lt Tuele RCAF in FD472 M took off at 09.25 hrs for a sortie over the beachhead area to direct naval gunfire onto two targets west of Trouville, being German coast defence batterys in large concrete bunker emplacements. The naval bombardment was very accurate, with direct hits on both targets. Upon request by the HQ ship an impromptu Tac/R was conducted covering the Trouville-Caen area to report on Allied and enemy movements. As the aircraft were refuelled, rearmed and had any problems that had arisen during the early morning sorties rectified, the pilots debriefed with the ALOs and intelligence officers. Just after lunch time, a BBC Radio recording team arrived and recorded interviews with selected pilots, capturing their impressions of the events they had seen earlier in the day. In the afternoon the Squadron was retasked with tactical reconnaissance in the areas behind the invasion beaches, looking for German reinforcements being moved into the area, with the naval gunfire spotting task being continued by other RAF and Fleet Air Arm units flying Spitfires and Seafires. The Squadron’s aircraft brought back the required information including photographs showing the extent of the Allied beachhead and lack of movement from any German reinforcements trying to move forwards towards the beachhead. 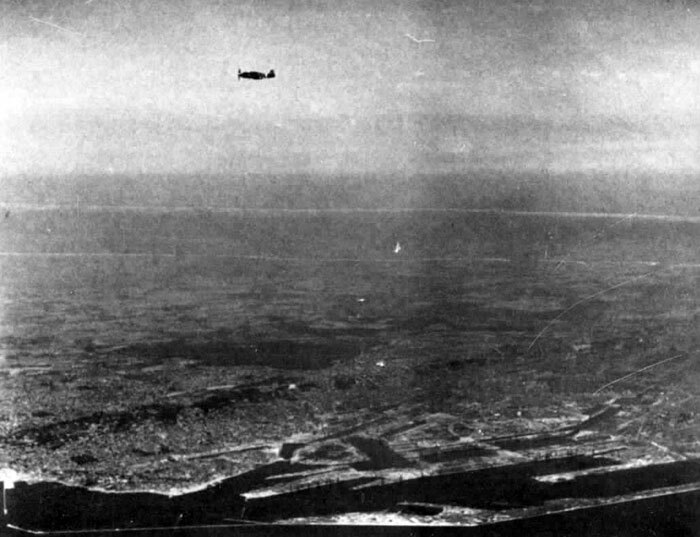 Flt Lt Brown RCAF in FD506 A and Flt Lt Hall in FD546 G took off at 19.25 hrs to conduct a Tac/R well behind the beachhead area covering Caudebec – Rouen – Gisors – Gournay – Serqueux – Neuf Chatel, to look for any signs of German reinforcements being moved to the invasion area. Surprisingly there was little movement noted. Flt Lt Reahil in FD476 B and Flg Off Smith RCAF in FD471 E took off at 19.40 hrs to conduct a Tac/R of a railway junction to the south of Paris, again to check for any movement of enemy reinforcements. Again there was no unusual or significant movement noted. From the diary of Flg Off Basil Rachinger RAAF, comes this first hand account of the 5th and 6th of June 1944. No flying – preparing for “D” day which appears to be getting rather close. – Gee! at 8 PM the G/Capt Donkin told us our role & D day is to commence at daybreak tomorrow. Uncertain thoughts on the future. Confined to camp. Slept a very troubled sleep being awakened at 3.30 AM by the batman. Sweat was pouring out of me. Breakfasted at 4 AM, airborne at 5 AM. With Maurice Lissner controlled the bombardment of enemy coastal defences by HMS Montcalm 9 x 6” just prior to the initial landings – Port en Bassin (2000’ – 1hr 20 over target) Had box seat view of whole proceedings which looked remarkably under control – also not a Hun in the sky – bags of flak and our own boys though. Quite impressive watching utter hell let loose on both sides. Ack ack, coastal guns, rockets galore, ariel bombing, naval bombardment etc & thousands of ships across the Channel as far as the eye could see. Shell holes, water spouts, smoke, flames, smoke screens, debris etc, added impressiveness to the proceedings. Destroyer sunk, battleship hit, L.C.A. vanished leaving dirty mark in the water, Spit in death dive, E boats in Bassin blazing furiously, town razed to ground level, aircraft burning on ground. Flew second sortie from Lee on Solent, near Southhampton, at 9 AM. (55 minutes over invasion area) Hun coastal resistance ceased, barges now on a regular shuttle service to and from the beach. Did a Tac/R trying to find targets for more Naval Bombardment but without success. Flew 5 hours between 5 AM + 11 AM when we returned to base – happy but very tired. Eric Woodward is our only pilot missing. They think he baled out amongst the barges. Stood down at 10 PM, then to bed. “D” day is over. Port-en-Bassin mentioned in his narrative, was a small French port that was at the juncture of the British and American landing zones, between Gold and Omaha beaches. It was the scene of a lively exchange of gunfire between Allied naval units offshore (including the French cruisers Montcalm and Georges Leygues, US destroyers USS Emmons and USS Doyle, US cruiser USS Augusta, and US battleship USS Arkansas), German coastal batteries and a German Flak ship anchored in the port that saw the village devastated. 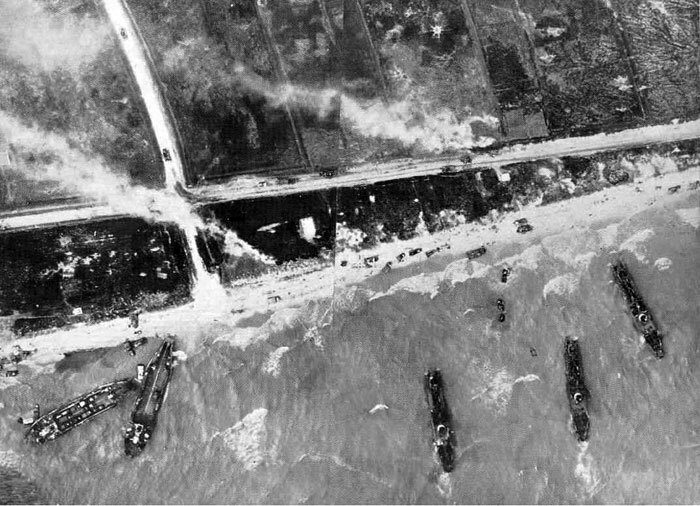 Photograph of the Invasion beaches – Gold Beach - taken by a pilot from No.268 Squadron at 1000hrs on June 6, 1944. The photograph shows the coast at Ouistreham. 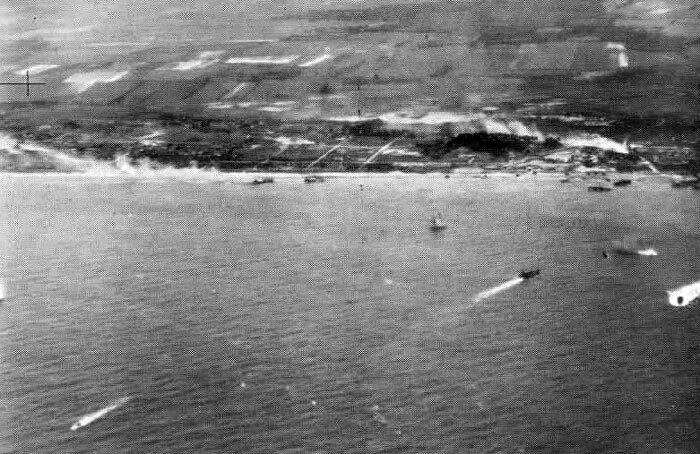 Smoke from the bombardment and battle for the beaches can be seen along the shoreline. Naval landing craft are seen shuttling to and from the landing beaches bringing in reinforcements and supplies to support the first wave of Allied troops ashore. Instead of the usual ‘zero’ feet the Squadron had been photographing this area, due to the requirement to avoid Allied naval anti aircraft fire, operations over the invasion fleet and immediate beach head area had to be conducted above 4,000 ft. Once beyond the immediate beach head area and inland, pilots could descend to below 1,000 ft above ground level to conduct their sorties. All of the Squadron’s pilots brought back with them their own images of the Invasion, both photographic and locked away in their memory. Each had their own ‘front row seat’ view of the invasion as it took place beneath them. Most had vivid memories of the impact of naval gunfire that they had directed onto the Invasion beaches just before the landing took place, and then the direction of the naval gunfire onto remaining pockets of resistance. Others remembered the effects of the German’s defences, with landing craft destroyed and crippled, and of the waves of Allied aircraft prowling over the Invasion fleet awaiting some reaction from the Luftwaffe. More than one pair of the Squadron’s Mustangs had to avoid the attentions of the masses of Allied fighters over the beach head, their lack of invasion recognition stripes on their upper surfaces requiring closer inspection and confirmation of their friendly status. As quickly as the aircraft landed, the cameras were stripped of their exposed film magazines, reloaded with fresh film magazines, refuelled, re-armed if necessary, whilst the pilot’s were debriefed by the intelligence officers on what they had seen. A cup of tea, a quick cigarette, a hot bacon sandwich, and then pouring over the fresh, wet prints straight from the mobile film processing unit, to pick out possible targets for future sorties and point out features of interest to the intelligence officers. A quick briefing from the intelligence officers on the next sortie, maybe a quick word with the CO or the Flight Commander, some flight planning with the maps and charts, calculating the headings, the distances, the time at a given airspeed between each point, areas to avoid, and then it was back to the aircraft. A quick stop to relieve oneself before strapping back into the aircraft, then start engine and on the way for the next sortie over the beachhead. The following few days saw the Squadron flying sorties at the highest rate possible, in order to bring back information on the movements of German reinforcements trying to get through to the beachhead. Many times the Squadron aircraft returned with photographs that led to the dispatch of rocket firing Typhoons, medium or heavy bombers to disrupt the German’s reinforcement efforts. A number of aircraft returned to base showing the scars of clashes with the German defences, the Luftwaffe at this stage starting to make its reappearance over the battlefront, but the greatest threat still remaining that from enemy flak. The Squadron’s aircraft added their own share to the German’s woes, letting loose with the Mustang’s four 20mm cannon where appropriate, especially against German troop and supply transports. June 7 1944 eleven pairs of Mustangs were dispatched during the day for Tactical Reconnaissance sorties. The primary purpose of all these sorties was to check for the movement of any German reinforcements towards the beachhead area. There was no significant enemy movement sighted during the sorties conducted during the morning, whilst those in the afternoon and early evening saw a higher level of ground activity and also an appearance by four possible Me-109s by one sortie. The German flak during the afternoon sorties was also much more active, with heavy flak being received from a number of locations. Squadron pilots take time out to be photographed near one of the Squadron’s North American Mustang Mk.IA aircraft. There photographs were most probably taken at Odiham in July 1944, before the Squadron moved to France. Pilots shown with the aircraft above are: on wing (left to right) Flg Off BFN Rachinger RAAF, Flg Off AT Lord, Flg Off GKN Lloyd, on ground Flg Off FR Normoyle RAAF, Flt Lt FG Barber. Note the fairly neat black and white invasion stripes painted under the wing including up under the fairing for the cannon. Thus ended No.268 Squadron’s D-Day and D+1. The next months would see them fly intensive tactical reconnaissance sorties at low level in support of the 1st Canadian Army as it advanced across the Continent. 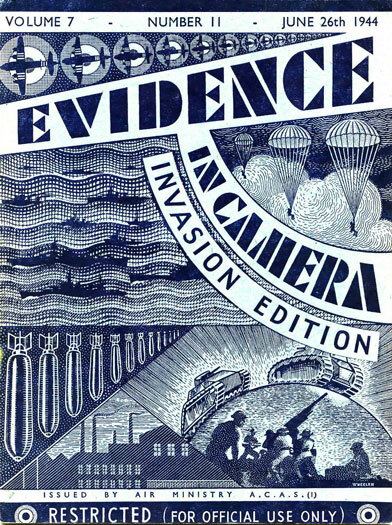 Some of the more striking reconnaissance photographs that had been taken by the Squadron’s pilots and aircraft in the lead up to the Invasion and afterwards would find their way into the RAF publication ‘Evidence in Camera’, the classified record of the RAF’s photographic reconnaissance successes. In mid July 1944 the Squadron started to receive the first of their Hawker Typhoon FR-1b aircraft, to become the RAF’s only large scale user of the type. The Typhoons would prove not to be entirely suitable for the Squadron’s role and would be retired by November 1944. The War would eventually end with the Squadron based at Celle, flying primarily Supermarine Spitfire FR.XIVEs with a number of their long serving Allison engined Mustangs still being used daily for operational sorties. They would retire the last of their beloved Mustangs in August 1945. 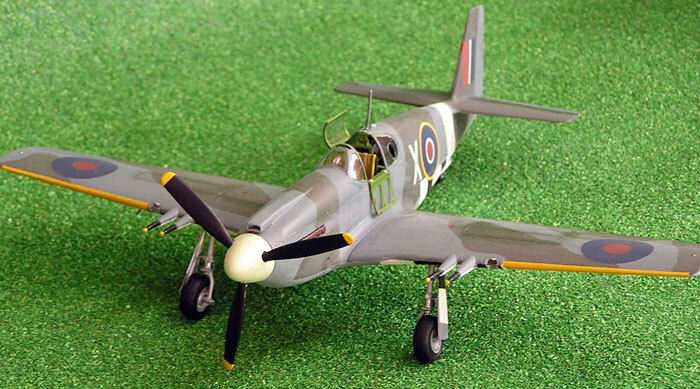 Using the Accurate Miniatures 1/48th scale model of the Allison engined North American Mustang Mk.IA as used by the RAF, these two models have been built in the representative camouflage schemes and markings of two aircraft from No.268 Squadron RAF in 1943 and 1944. Firstly, FD507 H which commenced serving with the Squadron in July 1943, and was still serving operationally with them on D-Day. FD507 is shown as when it was flown with the Squadron in August 1943. Secondly, FD535 X which commenced serving with the Squadron also in 1943, and would be with them into early 1945. 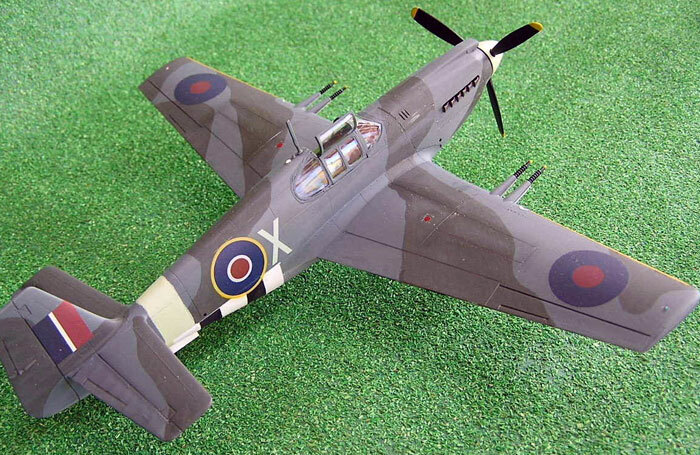 X was one of a number of Mustangs equipped with the vertical camera installation pioneered by the Squadron for use by the RAF, and flew sorties on D-Day. Here X is shown with the marking scheme for the Squadron’s aircraft worn for D-Day. Both models have been based on photographs of the subject and other Squadron aircraft which are held in the authors collection and that will appear in “Adjidaumo – Tail-In-Air”.